When it comes to in-state rivalries, there’s an older brother and a younger brother. That’s just the way it works whether you like it or not. In Kansas, especially in basketball, Kansas has always been the big brother and Kansas State has always been the little brother. It isn’t that K-State hasn’t been successful. The Wildcats have been to 30 NCAA Tournaments and even went to the 1951 National Championship game. K-State has also won 19 regular-season league titles and two league tournament titles. It’s just that when you’re down the road from the Jayhawks, who have won three NCAA Tournament titles and have their arena and court named after two of the true pioneers of the game — one of which invented the game — it’s hard not to be overshadowed. Well, that pent-up frustration has to have somewhere to go at some point. 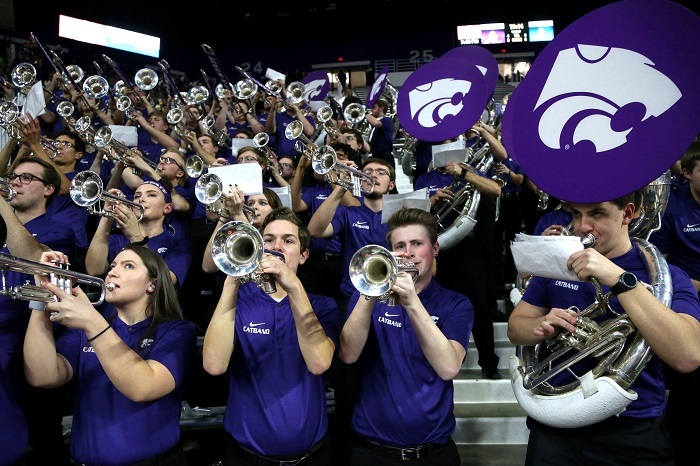 And on Tuesday the Wildcats (17-5, 7-2 in Big 12) funneled that into a 74-67 win over the Jayhawks (17-6, 6-4). That postgame celebration on the court looked sweet on TV. The last time the Wildcats had beaten the Jayhawks was Feb. 23, 2015. Yeah, it’s been a fair stretch of time, Manhattan. Diarra, a sophomore, was instrumental in giving seniors Barry Brown Jr., Dean Wade and Kamau Stokes their first win over the Jayhawks. He had 11 points off the bench, along with 3 assists. But one shouldn’t overlook the seniors, either. Wade had 12 points and 9 rebounds. Brown had 18 points and 5 assists. Stokes did a lot of damage in the first half and finished with 9 points and 4 assists. And guard Xavier Sneed? He had 14 points and his three 3-pointers were just enormous. 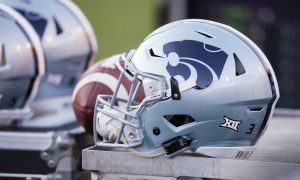 Going into this game I felt things favored Kansas State, even though the Wildcats are not the best offensive team in the Big 12. In fact, the Wildcats are one of the worst. Tweet for context follows. Yeah those numbers aren’t optimum. But K-State plays some of the best defense in the country and the Jayhawks have been a train wreck on the road so far this season (1-5 in true road games going into Tuesday night). 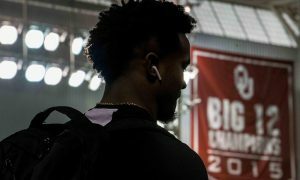 Plus, guard Marcus Garrett was unable to play due to injury. Couple that with the injury to Udoka Azubuike and the suspension of Silvio De Sousa and the “depth” I think everyone thought the Jayhawks would have this season seems practically sapped. But, still, it’s Kansas. They’re the big brother. And when big brother comes to town you have be ready for anything. And one thing the Wildcats weren’t quite prepared for in the first half was the Kansas zone. The Wildcats pushed out to an 8-point lead in the first half. Kansas head coach Bill Self is a man-to-man defense kind of guy. But sometimes the moment demands you make a change. Midway through the first half Self moved his team into a 2-3 zone in the halfcourt. One of the benefits to switching from man-to-man to zone in the middle of a game is the change of pace. If you play the zone right, you can dictate pace. K-State was running the floor and pushing the pace. The zone slowed the Wildcats down, made them a bit passive and allowed the Jayhawks to get their footing back. Armed with a 13-4 run to end the half, Kansas had a 3-point lead. But there were signs of trouble. The Jayhawks were a turnover machine in the first half and that continued in the second half. By game’s end Kansas had 23 turnovers. You want to see a basketball coach’s blood curdle? Watch him watch his team commit 23 turnovers. Four Kansas starters had four or more turnovers, including point guard Devon Dotson, who finished with 13 points and 5 assists. I love Dotson’s game. In a year or two he’s going to be a grown man in this league. 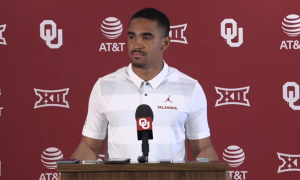 But he’s still prone to inconsistencies, and when you contrast that with last year’s point guard, Devonte Graham, you get a sense of the chasm between those two players. But Dotson can bridge that gap given time. It just won’t be this season. Plus, Lagerald Vick went incommunicado for a while. He played just four minutes in the first half. What? The Jayhawks’ best 3-point shooter on the bench? He didn’t have a foul, he didn’t appear injured. He just sat there until early in the second half. He finished with 7 points and one 3-pointer. It was one of the oddest things I’ve seen in some time. Dedric Lawson ended up with 18 points and 9 rebounds. Wade defended him a good portion of the night and he made Lawson’s life difficult. Still, he’s the best weapon Kansas has and he gritted this one out, despite a pair of minor injuries (including a knee-to-knee hit with Sneed). But with practically no frontcourt depth, the K-State game plan was clear. Make Lawson work for everything he got and get someone else to beat them. The problem was that no one else did. Garrett could have made a difference. Maybe he’s healthy for the rematch. Kansas never lost sight of Kansas State until the final minute, though. It was Sneed who hit the 3-pointer that put the Wildcats up six with 1:15 left. Then, it was the defense and the breakaway dunk of Diarra that pushed the lead to 8 points with 48 seconds left. Then Brown added a pair of free throws to make it a 10-point lead with 32 seconds left. Kansas had no timeouts and little time left to mount a comeback. 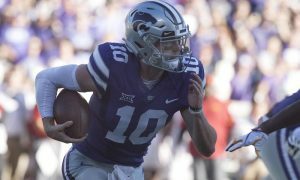 For Kansas State, it’s a watershed moment, and not just because the Wildcats broke their 8-game losing streak to Kansas. The win pushes the Wildcats into a half-game lead over Baylor in the Big 12. Depending upon the result of the Baylor-Texas game on Wednesday, the Wildcats could be tied for the Big 12 lead or a game up on the Bears. And, wouldn’t you know it? The Wildcats travel to Waco, Texas on Saturday to face the Bears. There’s a real chance that game is for Big 12 supremacy with eight games remaining afterward. 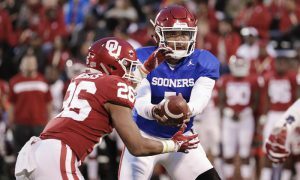 Beating Kansas was critical, in my opinion, and not just for Saturday’s game. 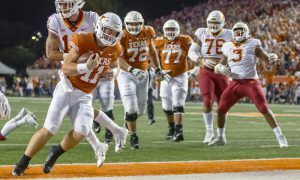 After Baylor the Wildcats face unpredictable Texas in Austin, Texas, and the Wildcats lost their first meeting. Then K-State returns home the following Saturday to host Iowa State and looking for a sweep of the season series. Plus, K-State must play Kansas and Baylor again and do it back-to-back. So the race isn’t over by any means. But Tuesday’s win was crucial for K-State to control its own destiny. As for Kansas, well, this is a watershed loss for them as well. The Jayhawks dropped to 6-4 in league action. Did you know the last time Kansas was 6-4 in league play? That would be the 1993-94 season. Those Jayhawks, coached by Roy Williams, ended up 9-5 in Big 8 Conference play (remember the Big 8) while Missouri won the league with an undefeated conference slate. 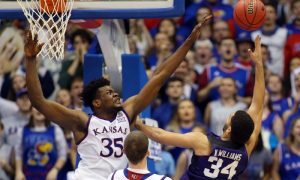 That Kansas team failed to win the Big 8 Tournament and reached the Sweet 16 in the NCAA Tournament before losing to Purdue. Kansas is now two games back in the league race and the best it can do now is a season split with the Wildcats. Plus, there’s “The Streak.” That’s the 14 straight Big 12 regular-season titles the Jayhawks have won. The last time Kansas failed to win the regular-season title was 2003-04 season. Kansas was 12-4 in league action, 24-9 overall, failed to win the Big 12 Tournament but managed to reach the Elite 8 in the NCAA Tournament. 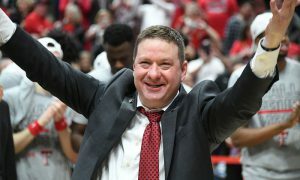 That was Self’s first season as head coach. The Wildcats, that season, were a .500 team. This is unfamiliar territory for Self and his Jayhawks. Like many, I took Kansas to win the Big 12. I knew there would be bumps, but I felt Self would figure it out. Right now, it looks like he might not figure it out this season. Wednesday night features two games. First, Texas hosts Baylor at 7 p.m. on the Longhorn Network. Then, at 8 p.m., TCU hosts Oklahoma State on ESPNU. Texas and TCU are on the spot in both of these games. They could each use a win.